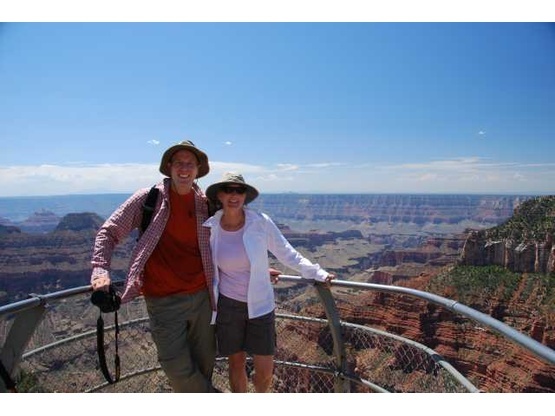 Honeymoon at Grand Canyon N.P. Getting ready to hike The Narrows in Zion N.P. We had nice business careers in downtown Chicago for many years - Fred in wealth management at a major Canadian bank; Laura in global business development with Compaq/Hewlett-Packard. We were fortunate enough to get retirement buyout packages from our respective employers at the end of 2012. 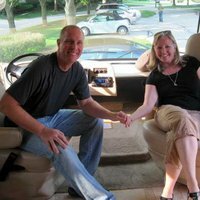 We spent 2013 and the first half of 2014 planning for full-time RV'ing, including buying our rig (a 30' Newmar Baystar) and equipping it, and planning for how we're going to spend the next couple of years traveling around the U.S. and Canada. We sold our condo and moved out of downtown Chicago at the end of May 2014, and as of June 1st we are now full-timers. We plan to visit all of the U.S. National Parks and many of the N.P. Areas, and we look forward to visiting friends and family members all along our way. We're figuring that this road trip will take us two-plus years to complete, and at this point we're very excited to be on the open road.... Laura has developed a website -- www.jollyoutthere.com -- which shares more about us and our adventures thus far. We'll come back to this one after we have some RV'ing skills/expertise to share. As of now, we still have our training wheels on as far as RVing is concerned. But... we're both athletic and very much into sports. Fred knows his way around a bike as he cycled all the way across the United States a few years ago. Laura cooks and looks forward to perfecting her cooking-on-a-campfire skills. We're both good hikers and look forward to staying fit as we become full-timers by hiking and biking all around the country. Fred grew up in a small farming town in central Illinois; Laura grew up in a small town in Wisconsin. 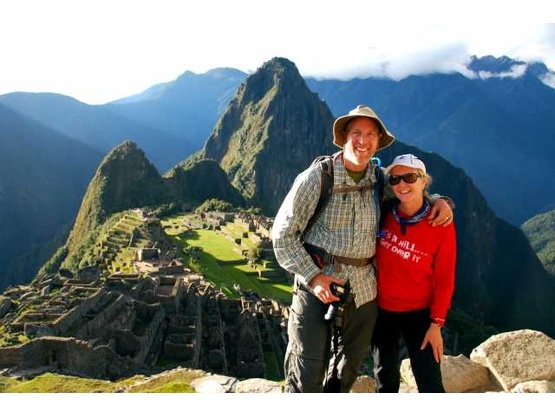 We met in downtown Chicago in April 2009 (it's a great story! ), realized we had a lot in common including the love of travel and outdoor adventures, and so we married in January 2012. While we've each called Chicago home for many many years, our hearts are still drawn to our small town roots, and when we're finished with our full-time RV road trip, we plan to settle down on a little plot of land outside a small town in southern Wisconsin. 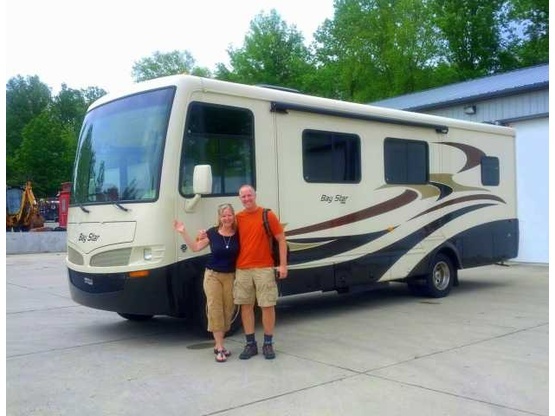 We have a 2010 30' Newmar Baystar that we purchased in May 2013 and named Charley, after John Steinbeck's travelogue "Travels With Charley." It's a class-A motorhome, and we tow a new 2014 Subaru Crosstrek that we purchased specifically to tow behind our rig.